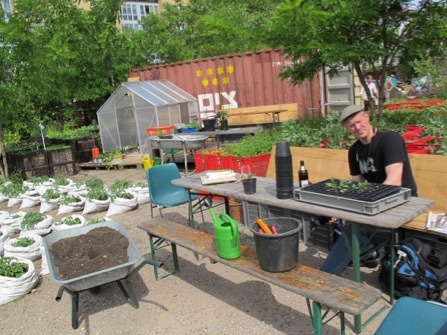 Over the last eight years, I have been cultivating and breeding farm-bred potatoes together with gardeners Bennar Markus and Mathias Wilkens in the self organized and publicly open Prinzessinnengarten in Berlin. 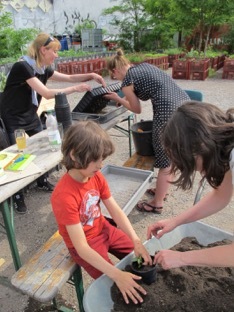 The direct engagement with plants has been a way for us to reconnect with human-plant knowledges that are difficult to trace among human records, since not much is written or otherwise documented of the history of pre-industrial farmers’ breeding in Europe. However, it is indisputable that before the appropriation of this knowledge by scientific and corporate organisations, farmers in Europe were breeding. 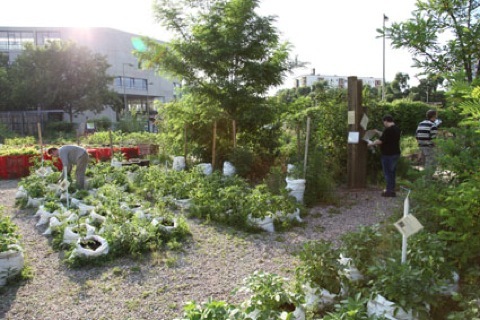 The old plant varieties that survive bear witness to that. This circumstance brings awareness of the fact that the memory of knowledge accumulation that these varieties carry is still alive and functional in the plant, even though it has been widely marginalized or even lost to humans. 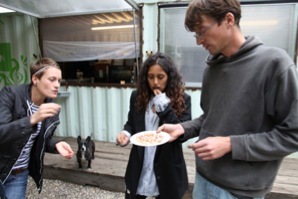 This in turn makes visible how farming and breeding are intra-species skills that are cultivated in a dialogue between plants and humans that also involves microorganisms, soil, weather, geological conditions and so on. 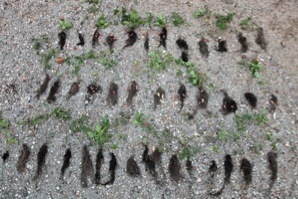 The breeding follows the method of Recurrent Selection, as described by Raoul A. Robinson in The Amateur Potato Breeders Manual. 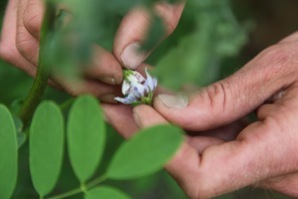 This is the most basic method of plant breeding, wherein each season the farmer scans the field for the most thriving plants. After harvest these are kept aside for their seeds or tubers to be re-sown in the season to-come. 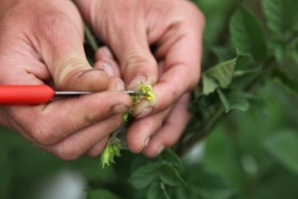 It is an ongoing process that cannot be separated from the farming practice. 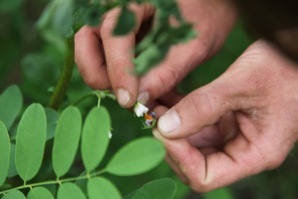 In Return to Resistance: Breeding Crops to Reduce Pesticide Dependence (1996), plant scientist Raul A. Robinson describes how this practice is based on all plants’ initial genetic flexibility to adapt to shifting environmental conditions. It enables them to stay resilient through shifting conditions over time as well as through climatological changes they may encounter as they migrate. 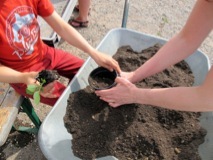 Continuously, over time, and without losing their inherent flexibility, the recurrently selected plants adapt to local conditions, such as soil quality, weather, micro-organism composition, and also to other traits they might be selected for, such as storage capacity, nutritional and culinary qualities, and so on. 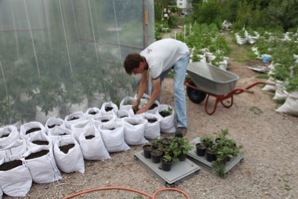 Preparations before planting the so called “motherplants”, the plants that we cross breed upon. 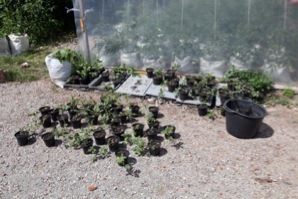 Motherplant varieties: Rothe Emmalie, Adretta, Rosa Tannenzapfen, Vitelotte, Mayan Twilight and three new clones from The Julius Kühn Institute with extra good resistance qualities. 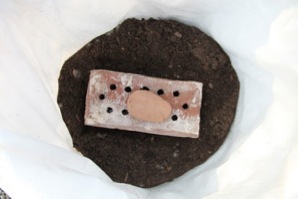 When preparing for breeding, the mother plant is placed on a stone. 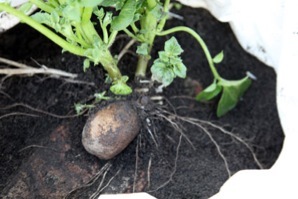 The potato is covered with soil until it has developed roots, then the soil above the stone is removed. 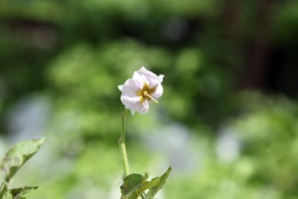 When the plant develops tubers these are removed in order to let the plant develop higher stems with more flowers instead. 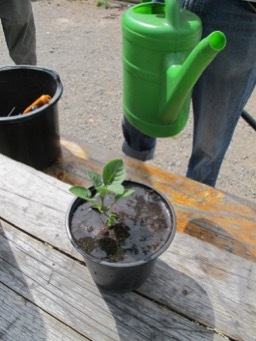 Seedlings from berries harvested last year are planted out in larger pots. 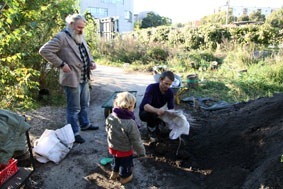 Workshop and presentation of The Prinzessinnengarten Breeding Project hosted by Bennar Markus, Āsa Sonjas-dotter and Matze Wilkens as part of the framwork of the exhibition Other Possible Worlds at NGBK, Berlin, April 30 - June 13. 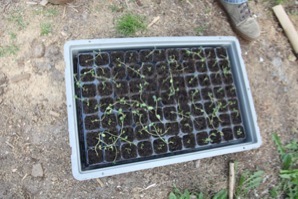 The seedlings are ready to be planted into larger pots. 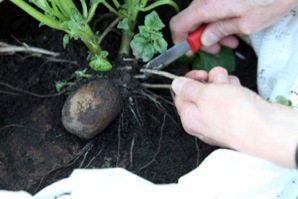 When the plants have developed a rich haulm, we gently brush away the soil above the stone that the potatoes are lying on. 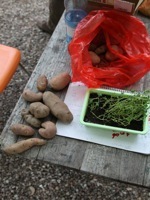 Now we can see both the roots ans the stolons develoed from the potatoes. 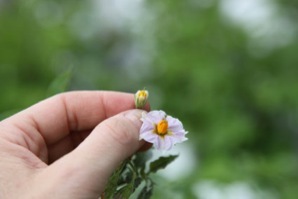 By carefully cutting off the stolons (from where the potato develops new tubers) we “chock” the plant into developing larger stems with many flowers instead. The many flowers we will use for the cross breeding. The flowers are already in blossom! Because of the very warm April this year, the plants blossom very early. 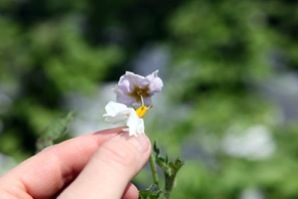 The cross breeding is made by gently removing the pollen from the flower just before the bud has opened. The stamen has to continue maturing for two more days before we do the pollination. 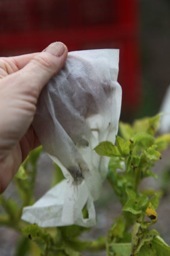 A paper teabag is placed over the flower to prevent insects and wind from pollinating the stamen before us. Afterwords we have learned that the pistils also should have been saved and then dried for two days, before the pollen is applied onto the ‘motherplant’, but this we didn’t know, and therefore we had rather few berries developing this year. 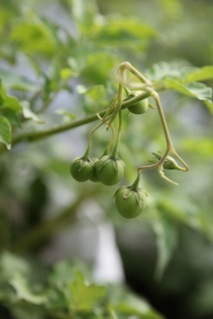 But we learn by doing and next year we will have more berries. 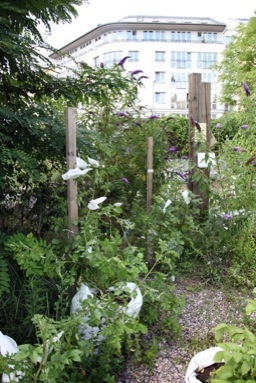 We used fresh pollen from the ‘fatherplants’ for pollination this year. After the stemen has matured for ca two days, it’s ready to be pollinated. 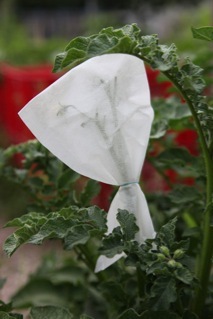 The bag is placed on the flower again, and we write the name of the pollen’s variety in order to keep track on the different cross breedings. 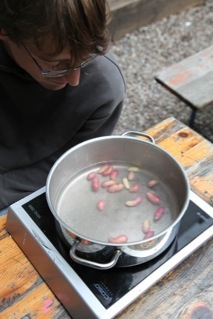 We gently boil and taste the small tubers from the sorted out seedlings. 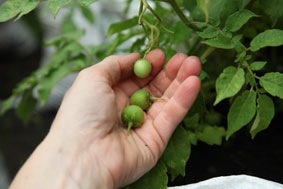 To our surprise the varieties already taste very different, and delicious! 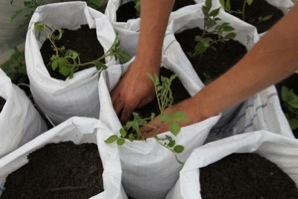 The remaining seedlings are planted into larger sacs. 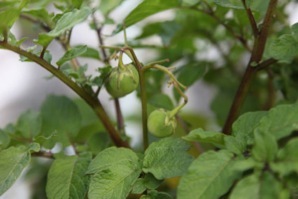 Some plants have already developed berries. 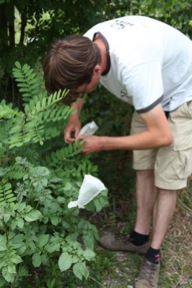 OBS that the berries are very poisonous and should not be eaten! Pollination goes on. 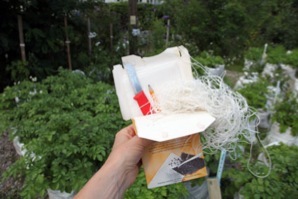 You need paper tea bags, a knife, a pencil and a fine ribbon. Berries are harvested. OBS that the berries are very poisonous and should not be eaten!!! 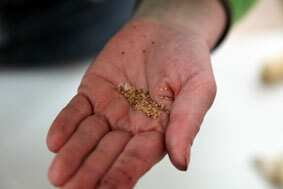 We harvest the varieties that grew best throughout the season. 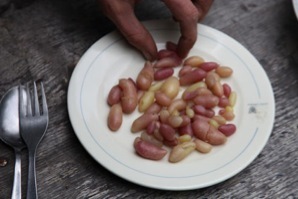 We checked their quality in general, and also boiled and tasted them. 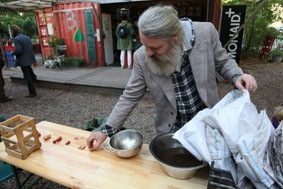 Leif Erich Christensen who is an artist and a gourmet helped us with the tasting. 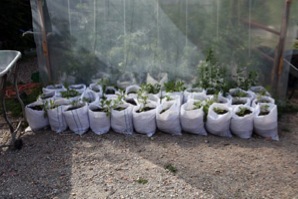 About 20 varieties were considered interesting enough to be kept and grown again next season. 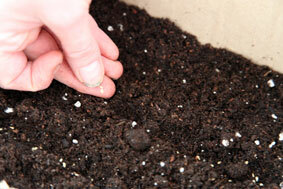 The seeds from last seasons crossings are planted indoor. 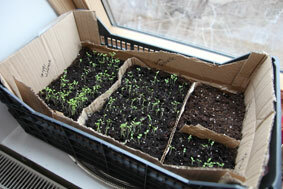 It’s still risk for frost and the seedlings have to grow inside until ca mid May (Berlin climate). 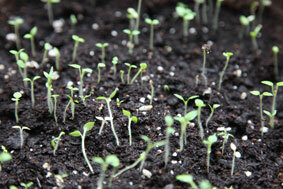 The seedlings are doing well. The Congo-sedlings are much later than the others. 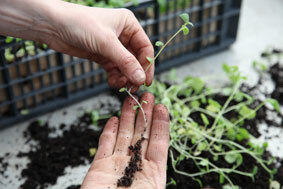 The seedlings are big enough to be replanted in larger individual cups. 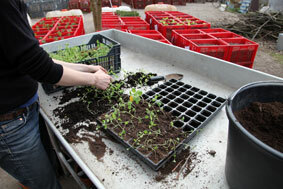 They are kept in the greenhouse until mid-May when risk for frost is over. 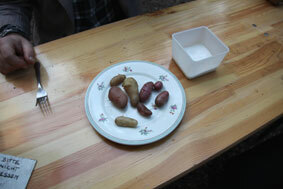 The tubers from last year’s harvest from seeds are planted. They were stored a bit too warm and have developed too long stolons, but we plant anyhow and add the experience to our list of learnings. 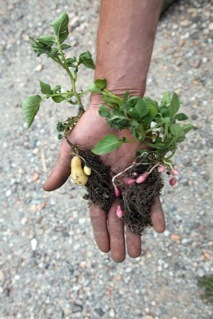 Some of the tubers did not survive the winter. 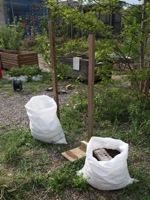 We had 10 varieties to plant. 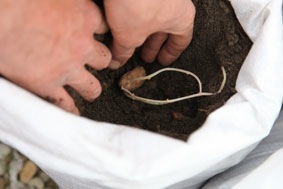 We planted in a mix of compost and last year’s potato soil, which is full of diseased that we deliberately want to expose the plants to, in order to get robust and resistant varieties in the end. Most of them have features fromr Rote Emma, who gave a nice berry harvest. 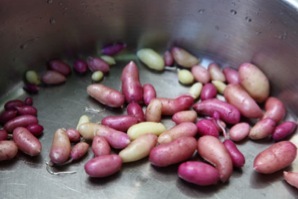 We are very curious on the outcome of these varieties. Text and photo by Åsa Sonjasdotter.